The New Akiles CoilMac ER Plus is a new and improved version of the classic CoilMac ER Manual Spiral Coil Binding Machine. 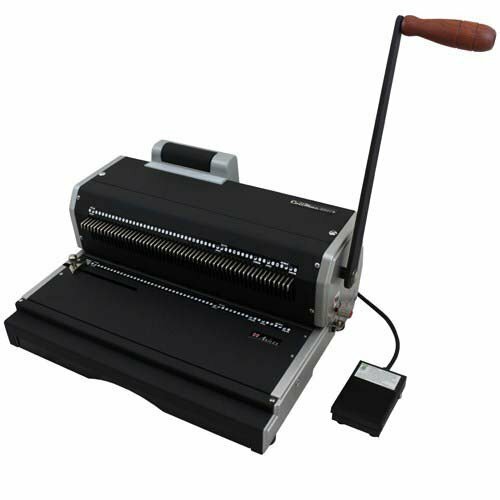 This machine includes the solid construction, electric coil inserter and other great features that have made the Akiles Coilmac ER binding machine famous. 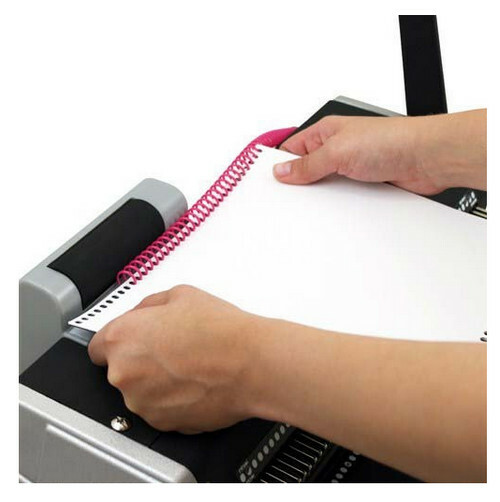 However, it provides a number of features that are simply not available on other comparable binding machines. The New CoilMac ER+ offers 4mm x 5mm oval punching holes to help make inserting coils easier than ever. 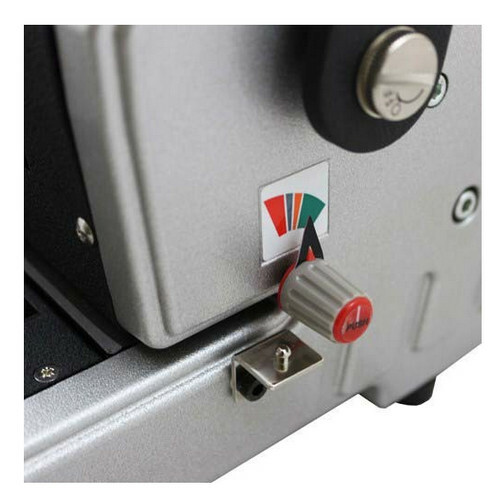 It also includes fully disengageable punching pins to allow you to punch virtually any document length. Plus, the Coilmac-ER-Plus offers a 0.248 pitch to help ensure that the holes aren't too closer or too far away from the edge of the paper. Like the orginal CoilMac ER, this system is easy to use, and will punch up to 20-sheets at a time utilizing the 4 to 1 coil punch die. 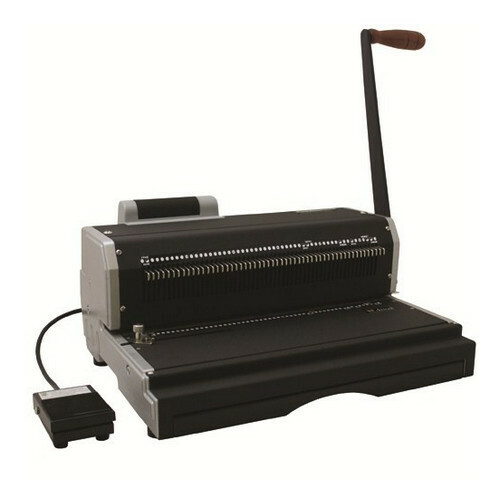 Plus a small electric roller is mounted on the top of the machine to help with spinning your coils onto your documents. The Akiles CoilMac-ER+ makes coil binding fast, easy and professional, making it the ideal partner for medium volume workloads. Super Strength Punch Mechanism with exclusive "Precision Guiding SystemTM" Blade Set: Cast-hardened & heat-treated steel dies provide superior strength & hardness. Exclusive "precision guiding system" guarantees a sharp & clean perforation everytime. Top Electric Roller Coil Inserter (Foot Pedal Operated): This easy to use and durable roller makes coil inserting surprisingly fast and easy. It is strategically placed on the left side of the machine so your coil will clear the punch handle while you are inserting. OVAL holes: Special 4 x 5mm oval holes. The first & only equipment of its class to offer this advanced feature. Makes coil insertion much faster as compared to standard round holes. When used together with our HD Electric Coil Inserter, it will drastically save your coil insertion time by up to 50%. LETTER 4:1 pitch (0.248"): This revolutionary 0.248" coil pitch is specifically designed to give you 44 evenly-centered holes in an 11" sheet, which provides the most ideal hole to edge-of-sheet margins and easier coil insertion. Hole pattern is 100% compatible with STANDARD 4:1 pitch coils. * = To avoid operator's fatigue, our punch throat shield has been set to accept up to 20 sheets only, based on average person's arm stength. ** = To punch thicker materials (such as hardboard), simply remove the punch throat shield & proceed to punch.